Installation at Jack the Pelican in NYC. 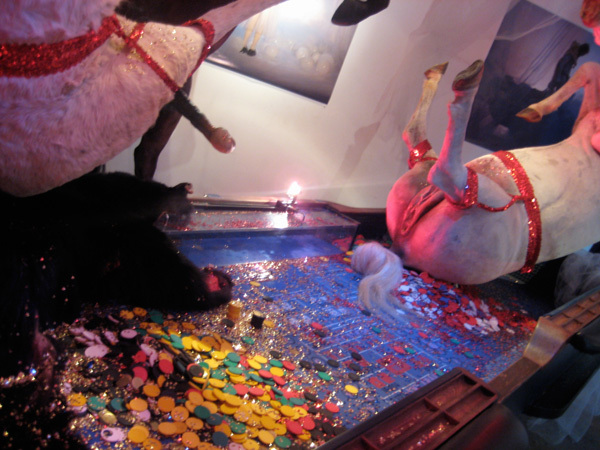 I woke up Sunday in a panic thinking, "today is the last day of Gregory de la Haba's installation at Jack the Pelican!" and I hadn't gotten pictures for all of you who couldn't see it in person. So for those that have not seen Greg's work, take a gander at some of these photos before diving into the installation below. The following installation was haunting. By haunting I also mean hilarious. He's a genius and I don't want to paraphrase so here's the statement from Jack the Pelican's website. Also included is a video of the piece in the best representation that I could offer including the original score by Ella Joyce Buckley. Enjoy! Over-the-top doesn't quite capture the incredible vulgarity of it all. 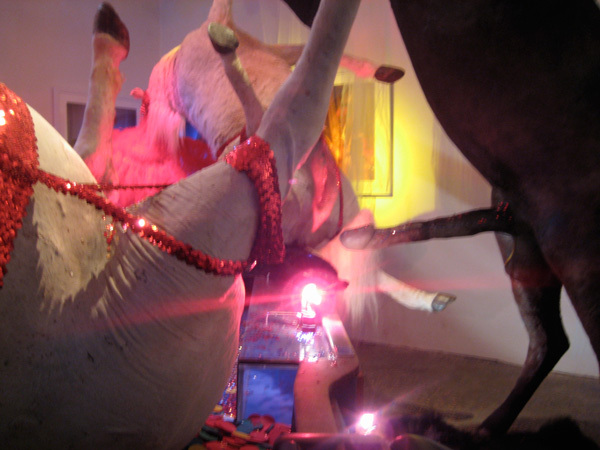 Gregory de la Haba's Equus Maximus is unabashedly pagan. 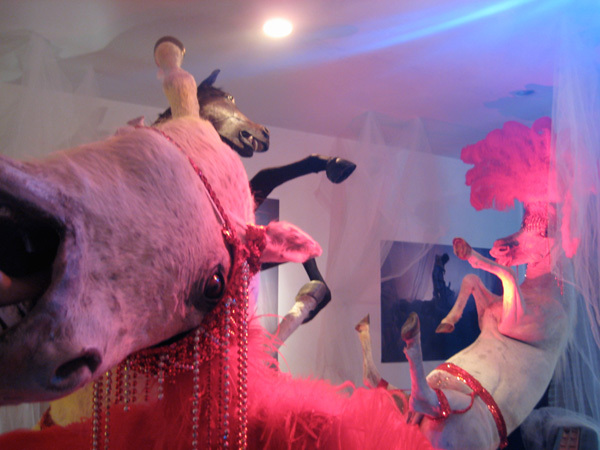 Grand carnal passions ignite in a full-scale installation of barbarism and gaudy frills. It is the decadence of Rome and the unquenchable greed of recent years. It is primitive hunger and lust, unbridledthe return of the repressed. 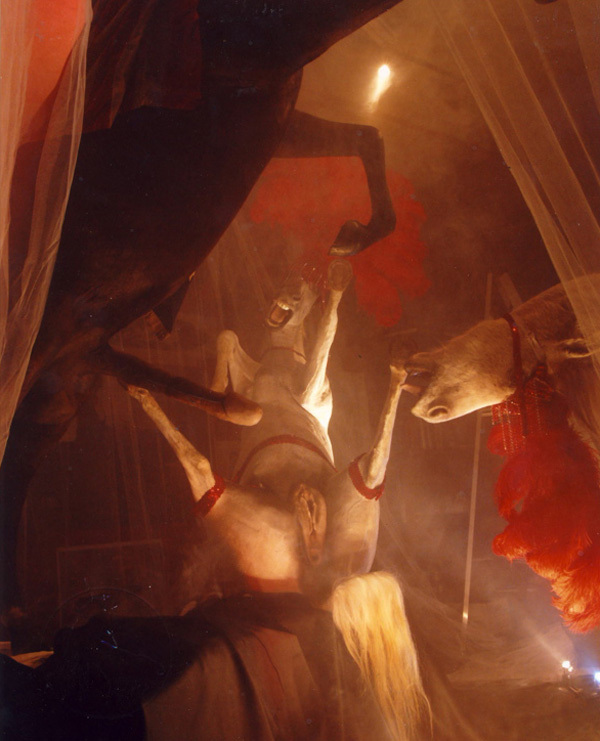 The main act is the massive bodies of horses as god beasts, poised in impossible throes of writhing lusta stallion rearing high (who knew they could be so big?) and mares in cabaret red plume headdresses, sprawled down against the soft green felt of a vast craps table, piled with the gold of victory. The ladies' backs arch wildly, legs spread wide in lusty anticipation. Even Caligula might blush. 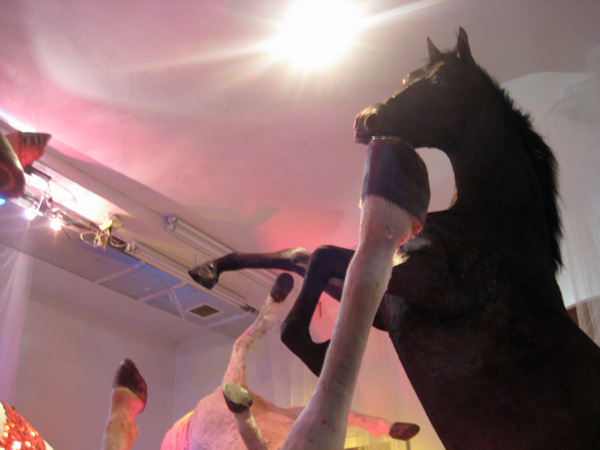 These are horses as gods, lusty and primordial. So accustomed are we to representations of the horse as an animal of profound balance and grace, the powerful torsions of equine spines and limbs here is startling. De la Haba has made them thus, skinning them himself and sculpting the underlying armature of forms over the course of four years. (It should be noted that no animals were killed in the course of this production.) He was thinking about the screaming horse in Guernica and Leonardo's unfinished statue, striving to express the power of the animal. 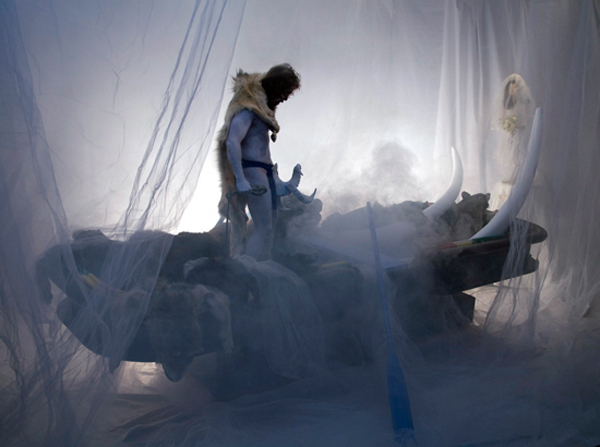 The artist finds his creative force in the gargantuan appetite of his animusin his blood, guts, meat and muscle. Adopting the persona of a primitive Ice-age hunter/warrior, he connects with this bestial hunger. His circus room is like a shrine, with his totems and trophies hung from the ceilingmammoth tusks and the vacu-packed carcases of his triumphs. 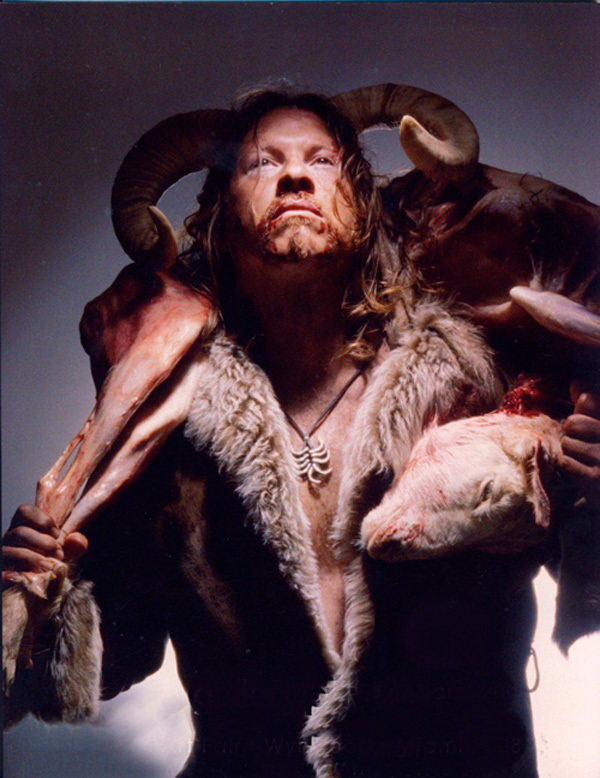 He reveals himself in large photos on the walls as proud viking of a beast man, standing tall, decked out in skins. But there is also an intimate and personal side to his humanity, which he revealls in paintings hanging round about the gallery. It is an imaginary family portrait and an intimate narrative, projected back to a time of innocence. We see him young and puny, fighting the grand horse. Here is the origin of his reverence for the awsomeness of the beast.